Downs by the Bay: Horses and Donkeys and Ducks, Oh My! Horses and Donkeys and Ducks, Oh My! Whenever someone asks me what words Braeden says, I answer, "Well, he can make farm animal sounds!" And they usually nod like that's cool. Better than nothing! When I say sounds, I mean sounds. If you ask Brady P. what a pig says, he won't say "oink." He puts his little fist up to his nose, plugs his nostrils with two knuckles and inhales, making an impressive pig snort. I like to show this one off for entertainment value and some good chuckles. He pants like a puppy. He shouts, "I-lie-lie-lie" to crow like a rooster. And for the horsey, he sticks out his tongue and lets the raspberry sound fly. At first I didn't understand how he could flutter his tongue through his lips. It took me a few tries to get it right myself. It turns out that Braeden is obsessed with farm animals. 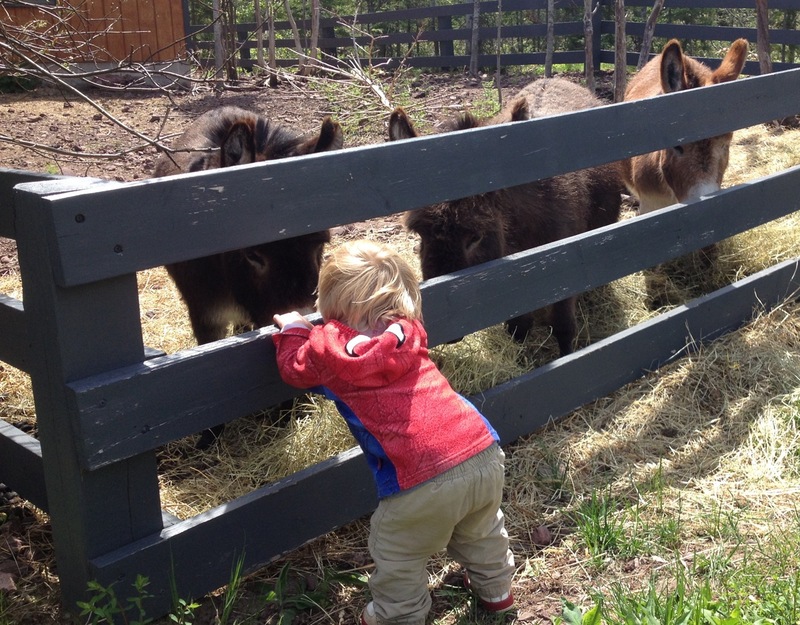 He loves all things farm, especially Old MacDonald and any person that could possibly be related to Old MacDonald. For instance, our milk carton has a picture of a young girl with blonde braids feeding her cow. When I open the fridge with B nearby, he points up to the top shelf and shouts, "Eh!" After a couple times, I realized he was pointing to little Miss MacDonald, as we now call her. He makes me take the carton out, so he can give her a kiss and a hug. Then we wave good-bye to little Miss MacDonald, and she goes back in the fridge. I had to cut her out of an old carton, so he can see her in other parts of the house and the milk can stay cold. One of his favorite animals is the horse. 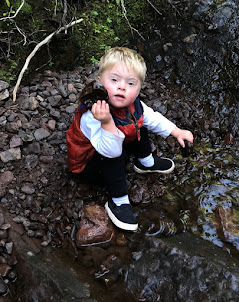 It was his first animal sound, and one that he fervently points to in books or along the side of the road when we travel. It turns out, there are three horses within a wagon-pulling distance from our house. We went to visit them the other day. 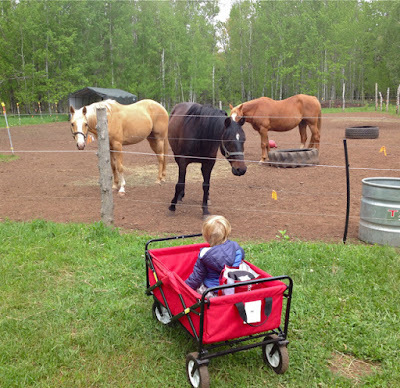 I kept Brady P. in the wagon, so he didn't get electrocuted by the fence or run under the large animals' hooves. They were eating when we stopped by. Have you ever watched a horse eat off the ground? Their lips are like vacuum cleaners fluttering back and forth, sucking that grass right off the ground. They really clean it up! About a minute after our arrival, they decided to check us out. All three of them at once. Luckily, my fear of horses has been waning, so I wasn't alarmed like I was when we visited the year before. Braeden waved and told them what sound the horsey makes -- in case they weren't sure. Once they realized we didn't bring them any food, they went back to vacuuming grass. We marveled for a while, but when the blackflies came out to eat us, I carted Brady P. back home. On a different day we went to see the miniature donkeys at the Dapple-Gray B&B. They are such sweet creatures. I petted their furry noses, but Braeden wasn't ready. He did get a bit brave while they were eating, though. He watched them eat for a while, then decided to throw rocks at them. "Nope!" I called. "We don't throw rocks at our friends." After ignoring me, and hitting the fence with a couple more stones, it was time to go. 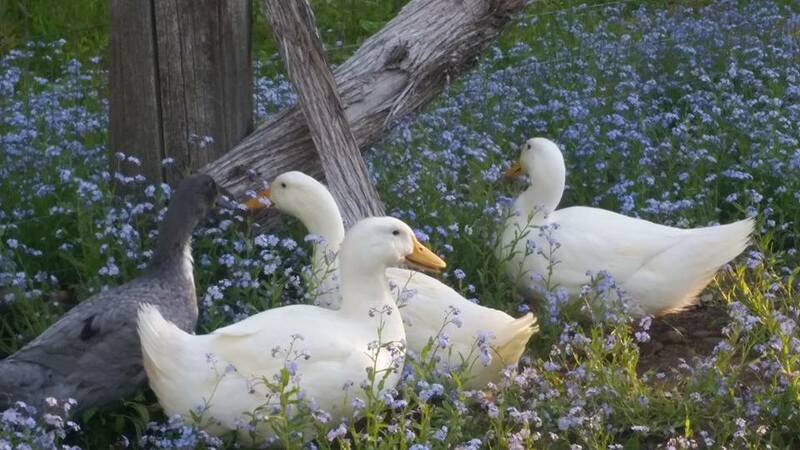 Our friend Staci, over at Into the Woods Mini Golf and Gardens (a great spot for mini golf, wandering through the flora and gathering with friends), started raising ducks this spring. 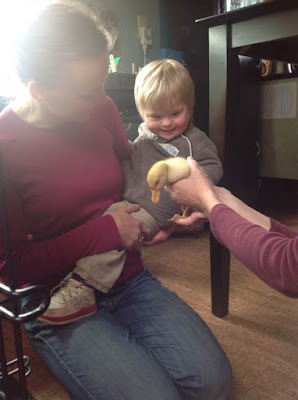 Braeden got to go visit when they were still duckling balls of fluff. He fell in love with them. He loved to pet them and watch them run around and peep. As they got bigger, he still liked to pet them and get as close as possible. Now that they reached full-size, his favorite thing is to watch them flap their wings. "The ducky is flapping her wings!" I tell him. He claps after one of them gives him an elegant show. Then he taps his right thumb to his left palm to sign "more." So we wait for another flapper show. Braeden won't willingly leave the ducks. He would squat there all day at the door of their house waiting for a snuggle or a majestic flap. Staci is great because she will encourage Braeden to feed and pet the ducks. He's still a bit afraid to feed them from his hand, but we'll keep working on it. I enjoy watching Brady P. interact with animals -- especially when he can reach out and touch them or visit them regularly in order to form a bond. Animals are part of our world up here, so he gets a good dose. Maybe we will meet the bears at the campground next! There is so much excitement in his eyes when he makes piggy sounds. It is so pure! The donkey kick is pretty amazing too. It is so great how much he gets to experience. Great work, Amanda.